Recently mom made fried pizza which is street food in Naples, Italy. It had been quite some time since she had made it. My sister-in-law doesn’t remember eating it! Anyways, we had been talking about it with some friends who love fried foods. The method is not very difficult so I thought I’d share it here. You need some pizza dough. You can either make it yourself or you can purchase it already made. Many grocery stores sell the dough; Publix has it in their bakery section and I saw some at Trader Joe’s in the cheese section. It needs to be at room temperature when you fry it so be sure you give yourself enough time for that. 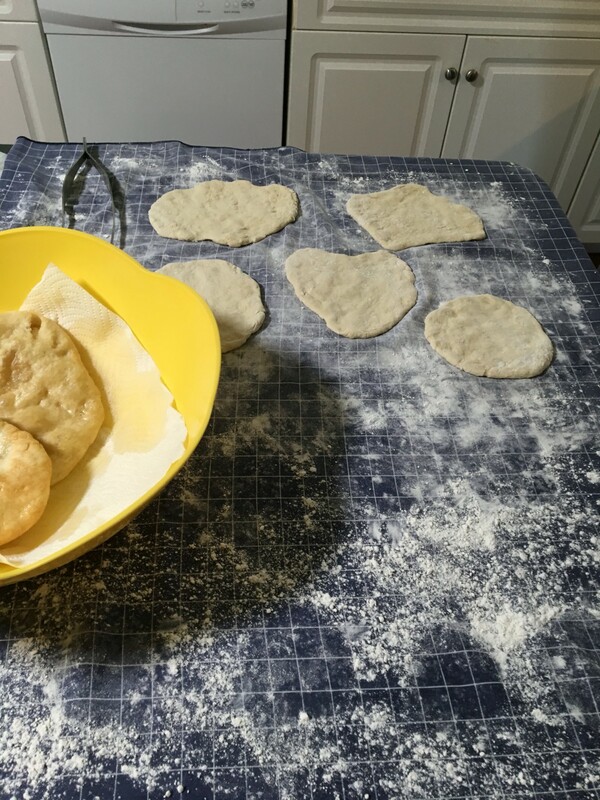 Once you have your dough then you want to section it into little balls and roll them out by hand, shaping them into little disks. We don’t use a rolling pin, just our hands. And don’t make them too thin. There are two ways we make them: plain and stuffed. The stuffed ones are little calzones, filled with a mixture of mozzarella and ricotta. You can even add a little ham or mortadella to the filling. I do not care for melted cheese (I know, I know) so I like the plain ones. On this day we only made plain but mom had little mozzarella cubes that could be used as a topping. Then you fry the dough. 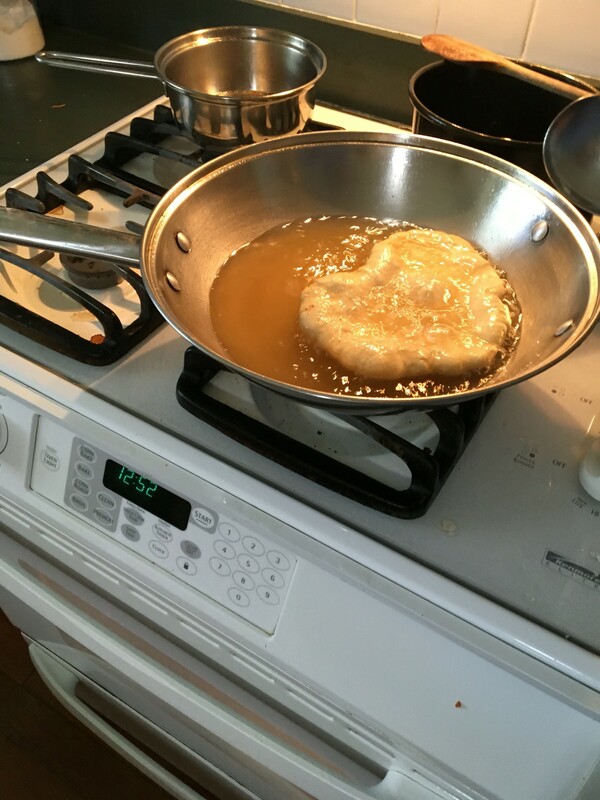 Use a deep frying pan (mom likes to use her wok) and bring peanut oil to temperature. You want it hot enough so that when you drop in a small piece of dough, it begins to sizzle immediately. Let one side turn golden and then flip to the other side. I like to spoon hot oil over the top to speed up the cooking process. Usually we cook these with two people: one shaping the pizzas and one manning the frying pan. It is best to serve these hot, so as soon as they start coming out of the pan, people start eating. This is not the kind of meal where we all sit together and eat. Often we take turns with the cooking so the cooks can get a pizza in too! 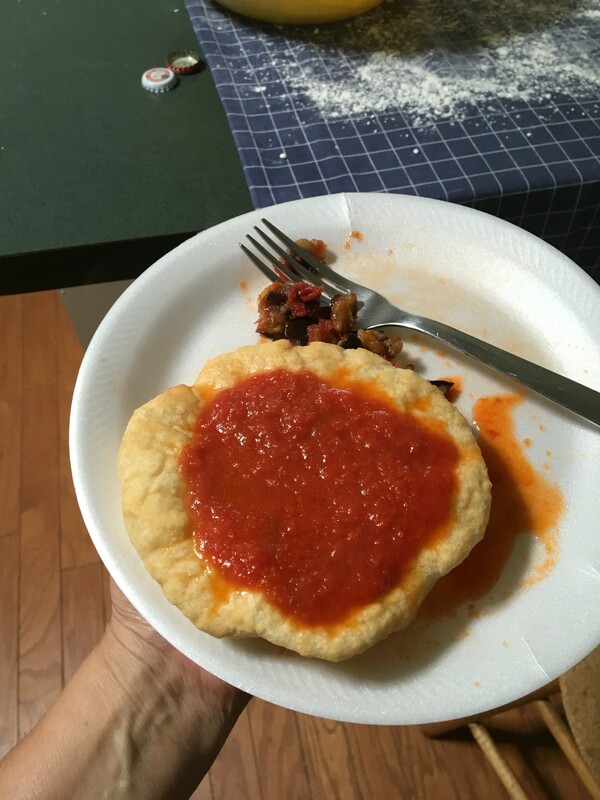 Top the hot dough with a simple tomato sauce you make yourself (olive oil in a pan; sauté a clove or two of garlic; add a can of crushed tomatoes; simmer for 15-20 mins). You can also add a little mozzarella on top but that’s actually deviating from tradition. Usually the cheese goes inside. Serve with a cold Peroni beer! Buon appetito! I need to try this! Bookmarking for later..
Yay! Lmk how you like it! HA!! Not quite, but so tasty!